this ECO friendly game saves on plastic and paper. Use your own timer and print out the score sheets from this site. The Playing Pouch is also the container. 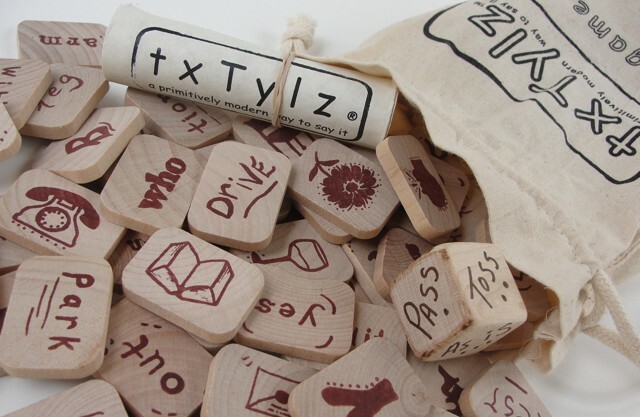 txTylz is a fun, interactive game that stimulates Creative Thinking and Intelligence! Grab as many pieces as you like (at least 10) and use all of them to state whatever you can that makes sense in an crossword manner before your 2 minutes is up. The more pieces you can play the more points you gain and if you use more than 18 pieces in one play within the time limit–you are a GENIUS. Other players hover over your play to see if they can gain points when you can’t play them all before your time runs out. The txTylz pieces may be used phonetically (as they sound), literally (as they are spelled) and symbolically (as they look) to say whatever makes sense in 2 minutes! Now here is the TWIST—proper English, spelling and grammar are not necessary. Say What??? Other popular board games limit play by WORD spelling only, and it has to be perfect. They also limit you by WORD use only. txTylz lets you make words as well as phrases and sentences. Think Caveman + Shakespeare + Einstein meeting today. How would they communicate? Use your TXTing skills to say it and PLay it…and lead yourself to the winning score. Slang sayings, Brand names, Proper names and even Country names are allowed. Play it anywhere on any flat surface. A great travel item for the entire family. txTylz is the new standard to test creative intelligence–how creative are you?